The number of renters in Washington and Sullivan counties increased by almost 5,000 in the six years between 2010 and 2016. And, the lion’s share of that increase came in Washington County. But look for some change when Census numbers for 2017 show up next month. The Town Lofts leasing office is now open as construction crews continue their rapid building pace. Census data show Sullivan County had 17,430 rental households in 2010. In six years, it increased by 900. But in 2017 and early 2018 the number of apartment units saw a big increase with developments like The Villas at River Bend, Overlook at Indian Trail, The Retreat, and The Town Lofts to name some of the larger complexes. During the same period, the number of rental households in Washington County increased from 15,082 to 19,867. That established what Universal Design and Construction Co. Principal Shane Abraham calls the “best supply-demand” mix I’ve ever seen in Washington County. Abraham is one of the region’s leading multifamily developers and recognized as the local multifamily market expert. 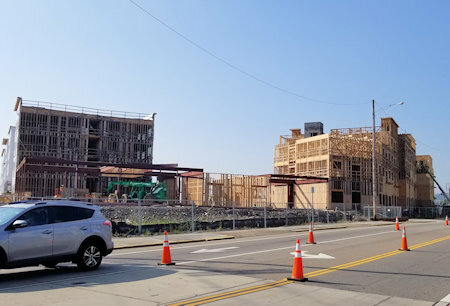 But developers, investors and city officials offering tax incentives have turned the focus on Kingsport and Bristol in an attempt to take some of the multifamily shine off Washington County’s housing market. Population – and some community ego – were drivers for this explosion of apartment development. It was a driver because until 2017 Sullivan was looking at a population decline and for local governments that meant fewer sales tax collection to help pay city employee salaries and services. The community pride factor was in Kingsport which was still feeling the sting over the number of new Eastman employees who drive past the Model City and settled in Johnson City and Washington County. The increase of renters over homeowners isn’t just a local issue. According to a national analysis by Zillow, the number of renters vs. those how owned their home increased about 5% from 2006 to 2016. Unfortunately, Zillow only looked at top-tier markets, so the Tri-Cities market didn’t make the cut. But the 2010 – 2016 local data mirrors the analysis findings. 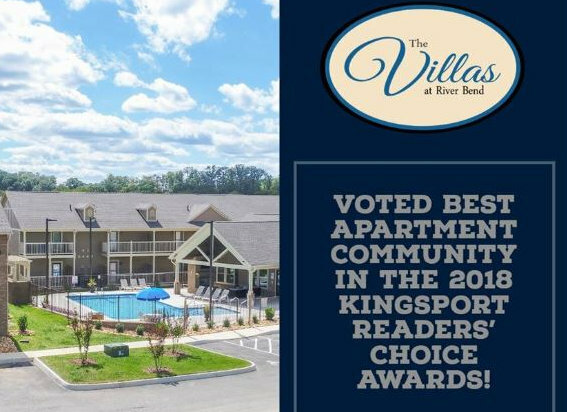 The Villas at River Bend net a local award before its ribbon cutting. Sullivan County’s homeownership rate decreased from 73.2% in 2010 to 71.6% in 2016. During the same period, it declined from 68% in Washington County to 62.3%. But neither homeownership or rental rates alone tell all the story. During the same six-year period that the rental rate increased 1.6% in Sullivan County, there was a 0.1% population decline. But Washington County saw a 3.6% increase in population during that six-year-period when its rental rate increased 5.7%. And yes, college students add to the mix because enrollment increased and more students were living off campus. So, what does today’s multifamily market look like? It’s in transition and pundits have lined up on both sides of the issue to argue about the wisdom of building so many new high-end apartments and asking where will the people living in them come from? Most of this is coming from the Kingsport market where the bulk of the Sullivan County multifamily development has happened. Abraham recently told a local meeting of commercial Realtors at the Northeast Tennessee Association of Realtors (NETAR) it would probably be a musical chairs situation in Kingsport for 18 months to two years. By musical chairs he meant renters moving from one complex to another to take advantage of move-in incentives. That dynamic heated up early this summer with the largest complexes in Kingsport – which are under one ownership – began offering a $1 move-in special. At the same time, some first new complexes coming on the market are offering their own packages. 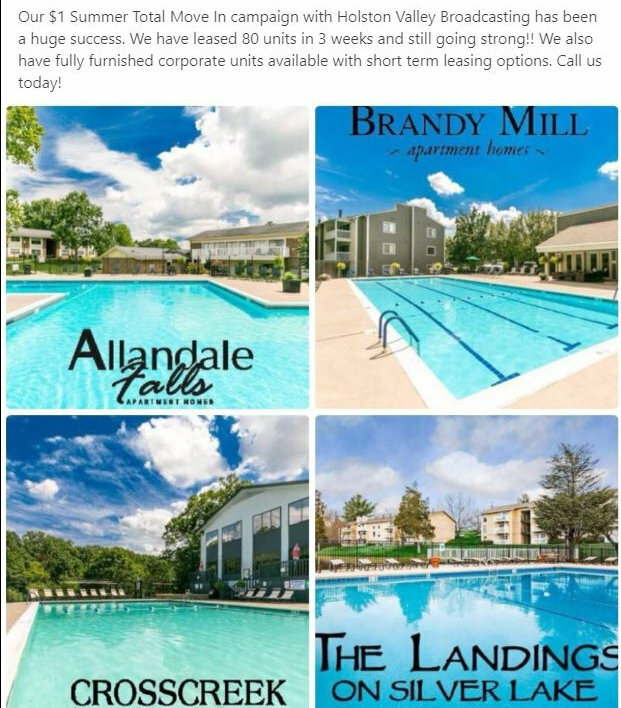 Investors who have condo rentals are also feeling the bite because that once stable rental market is being disrupted by the fact that renters can move to apartment complexes that have high-end amenities like gyms and pools at rates that are competitive with condo rentals. The bottom line – the final results of who will be seated at the market table when the musical chair factor stops – will depend on whether or how the new complexes can attract new residents from outside the Kingsport and Bristol areas. Some of that can and will take advantage of the short commute times between the area major jobs centers. But to attract new residents in appreciable numbers who have the income needed to occupy the new luxury apartments beyond the commute church will require job creation of a better quality of jobs than the area is now experiencing. Meanwhile, the new rental market and the lack of new single-family construction continues chipping away at county and the regional homeownership rate. I read about commuting trends in an article a week or two ago. Did these recent numbers and percentages come from First Tennessee Development District ?? or from maybe TDOT or the Federal Highway Administration ?? I’m not sure what article you’re talking about. Could you send me a link? My article make a general reference to short commuter times in the last graph. That information came from earlier reports I did based on inflow-outflow analysis of local communities from the Census Longitudinal -Employer Household Dynamics data. That data has not been updated since those earlier reports. There may be some reports with later data from TDOT, but I’m not aware of them.